Want to build a wooden garage? A wooden garage is the perfect addition to your house and garden. This is because the ample amount of advantages a wooden garage has to offer on a daily basis. Of course, it Is possible to park your car, bike or camper inside of a garage. But it also possible to store other valuable items such as your garden furniture, tools and an extra refrigerator. The wooden garages of Woodpro always have a low price and a high quality. Quickly continue reading to find the wooden garage that meets all your requirements! Have you ever considered all the advantages a wooden garage has for you? To begin with, you can store your valuable belongings easily in a safe place. The most prominent object you can store in a garage is probably your car. During winters your car will be nice and warm, and you will never have to scratch the ice of your car windows again. And during the summer your car will stay nice and cool, because it does not have to stand in de middle of the sun. Also things such as your electric bike or expensive tools you can protect against weather influences inside your wooden garage. Wooden garages have an important advantage when compared with brick garages: the price is much lower per m2. For less money you will have the same space, or even more space. Especially when you want to build a bigger garage, it is much cheaper to build a garage made from wood. Furthermore, it is much easier to receive a builder permit when you wish to build a wooden garage. Want to know more about the advantages of wooden garages? Simply contact Woodpro! Our dealers gladly inform you about the advantages. We understand that you want to build a garage of top-quality when you decide to buy a wooden garage. That’s why we only use the best possible wood at Woodpro. Low quality wood is sensitive for weather influences, which can even decrease the safety of the structure. Of course you want to keep your belongings safe and intact. Therefore, Woodpro only offers top-quality materials against the best possible price. The wood we use comes from northern regions with a cold climate. In these areas the tress grow much slower. Because of this, the wood has a very firm structure. Altogether, this creates top-quality wood that we can use for our wooden garages. At Woodpro we always think about sustainability when creating our wooden structures. We make sure all of our products are recyclable. And we do everything to reduce the amount of waste. We use residual wood for many types of other goals. Not only the wood we use for our wooden garages is important at Woodpro. Every part we use, such as windows, doors and the roofing should be of premium quality. For instance, the glass we use in our windows are of excellent 4+6+4 quality. Furthermore you can think about high-quality accessories such as door handles and shingles. Of course, also the locks we use are of all premium quality to make sure your belongings stay extra safe. And the best thing about all the accessories? At Woodpro most extras are included within the price! 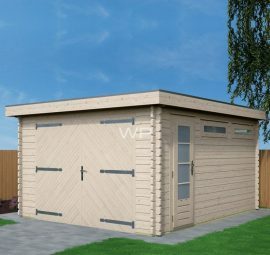 Do you want to build a wooden garage, and do you know exactly how this building should look like? Then Woodpro has the perfect tool: the 3D-configurator. Designing your own wooden garage has never been easier. Does de garage of your dreams have double doors and an integrated veranda? 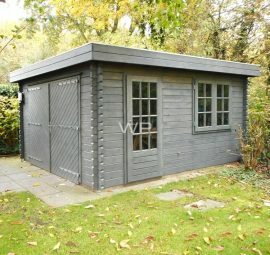 Or do you prefect a wooden garage with extra height and a turnover door? Easily select and adjust these options in our 3D-confgurator. It is even possible to adjust the floor within your wooden garage. It doesn’t get easier to build a wooden garage that fits perfectly with your garden and house! Since we are already exist since 1978, Woodpro has many years of experience with building custom-made garages. We produce and assemble wooden garages by our self. This is how we make sure we deliver the best possible quality, against the best possible price. Do you need help with designing the perfect garage that meets your wishes? Then you can always ask Woodpro for help. The specialists of Woodpro gladly transform your ideas into stunning designs. Or simply ask for our brochure: ideal if you need some inspiration. We do everything we can to deliver the wooden garage of your dreams against low costs. Do you prefer to build a turnkey wooden garage instead of a custom-made garage? This is also not a problem at Woodpro. 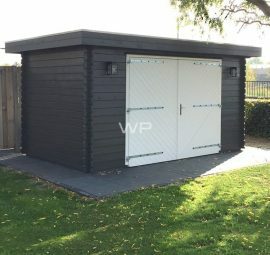 On our website you can browse to our extensive collection of wooden garages. Here you can check out all of our different types and sizes. For instance, we have different big garages in our collection where you can easily stall your car and camper. 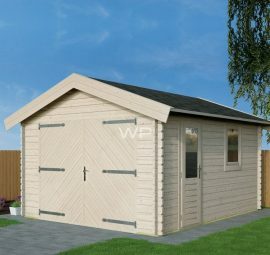 Or select one of our more compact wooden garages that are perfect to store smaller equipment. Without a doubt you can find the perfect wooden garage within our collection. Stop comparing suppliers of different wooden garages. You will find the perfect garage at Woodpro. And always against the best price. Choose your favorite garage from our complete collection. Or easily build the wooden garage of our dreams with our 3D-configurator. Do you have questions or specific wishes? Then don’t hesitate to contact our dealers. The dealers of Woodpro know everything about the latest developments. Quickly contact us or order your premium-quality wooden garage at Woodpro!